The Alpha is a bit like if your average front-loading Lowepro backpack had a baby with a classicly-designed Fjallraven backpack – and this cross-over comes with a high price tag. You can pick Forest Green for $249 or Slate Black with either Brown or Black leather trim options for $269. 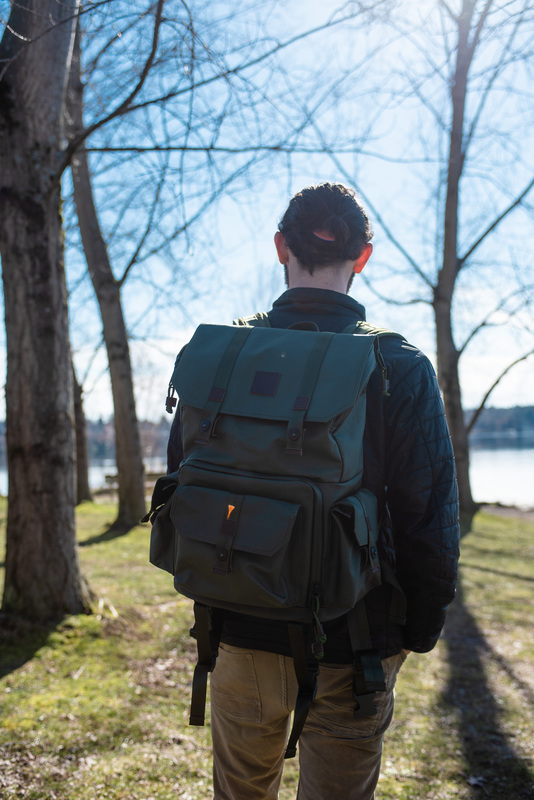 The Alpha's price tag puts it in the same bracket as bags like Peak Design's Everyday Backpack and Mindshift's Backlight and Firstlight. 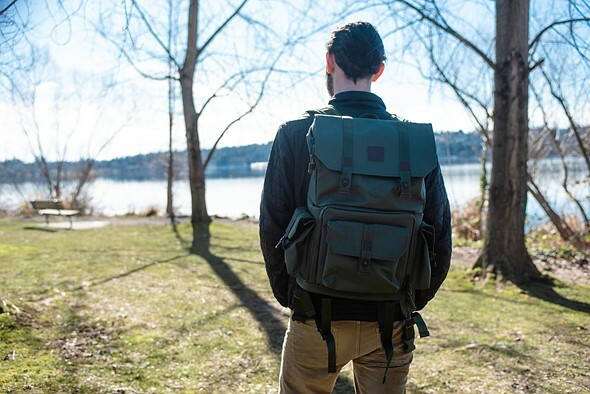 Both of Mindshift's bags carry a good deal more gear and have more of an outdoor focus. 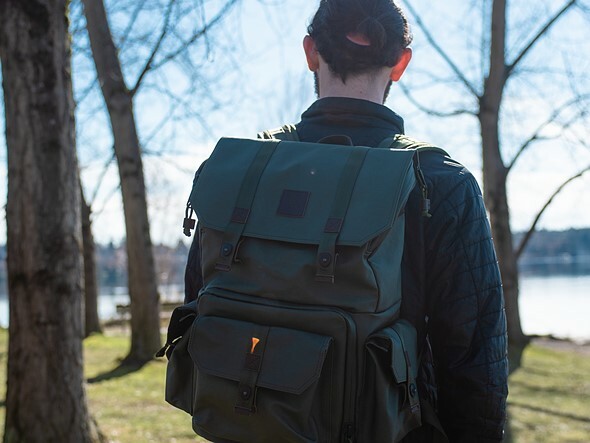 Despite Langly's outdoor-focused aesthetic, Mindshift's bags win in this category due to similar levels of weather-resistant materials and a harness design more akin to hiking backpacks, including padded hip straps. That said, neither of Mindshift's bags have very solid compartment sections for everyday items. The Alpha's style is really what's going to separate it from other bags. Classic and retro are the ideas here; if that's not your thing and you like a more technical/futuristic design, then look to Peak Design's Everyday Backpack or Tenba's DNA 15 Backpack. 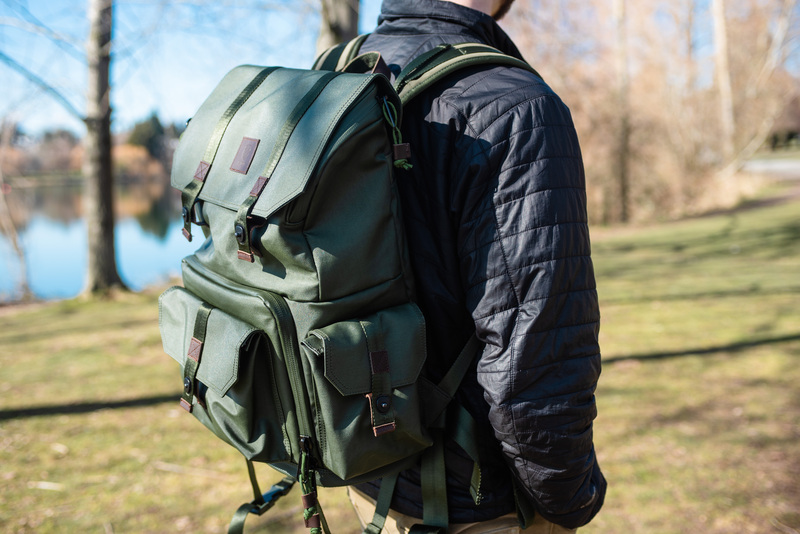 The Peak Design bag is essentially the same price and offers a bit more storage between its side panels and expandable top compartment. Meanwhile the Tenba also has an expandable top compartment, but like the Alpha has a front loading gear compartment and for only $199. The lower portion of the bag is the gear storage compartment, the upper portion is for personal items. 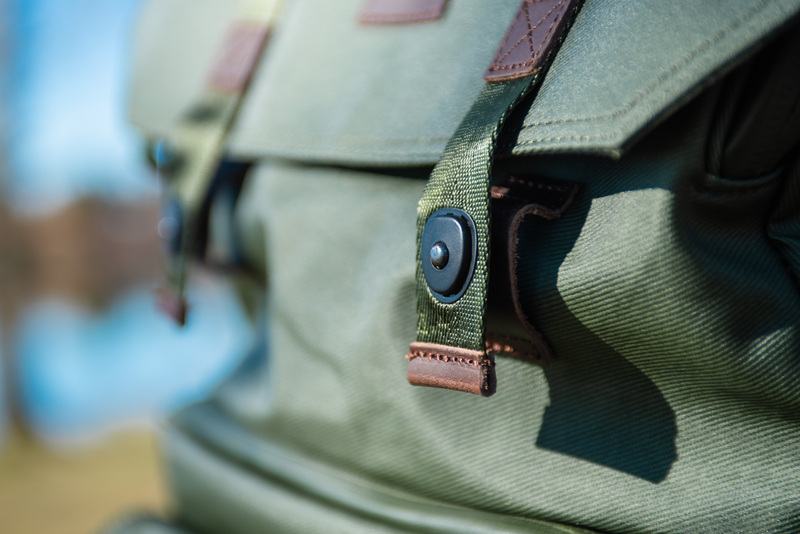 The Alpha's straps are not as padded as we'd like to see in a premium backpack and hip straps offer no padding. 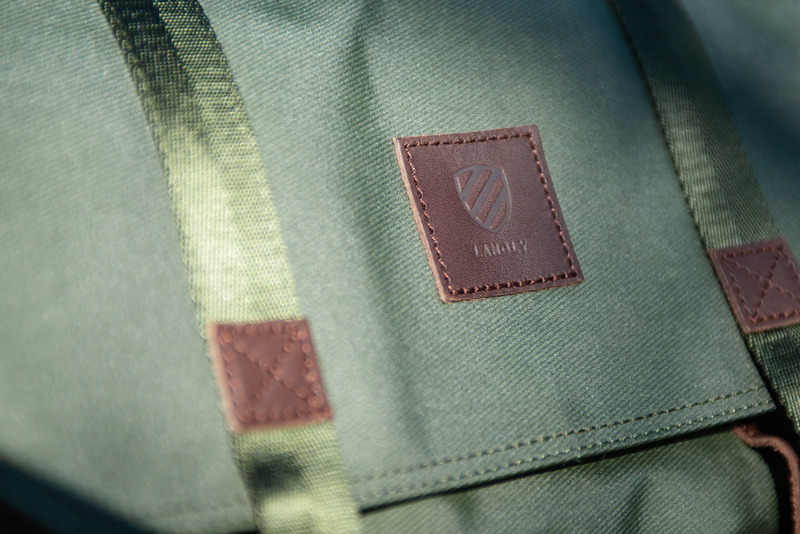 The Alpha looks a lot like Fjallraven's bags, featuring a single color with a leather-like insignia. Its shape also resembles old hiking backpacks a bit. Make no mistake, it looks good. I actually got a compliment or two on the bag when I was out wearing it. Again, the style is definitely a huge selling point here. I normally go for black in almost everything, but I enjoyed having something with a solid earth tone like the Alpha's forest green. The TPU-coated canvas exterior feels sturdy and truly weather-resistant. A flap over the top compartment provides an additional barrier to keep water out, though it feels somewhat redundant. 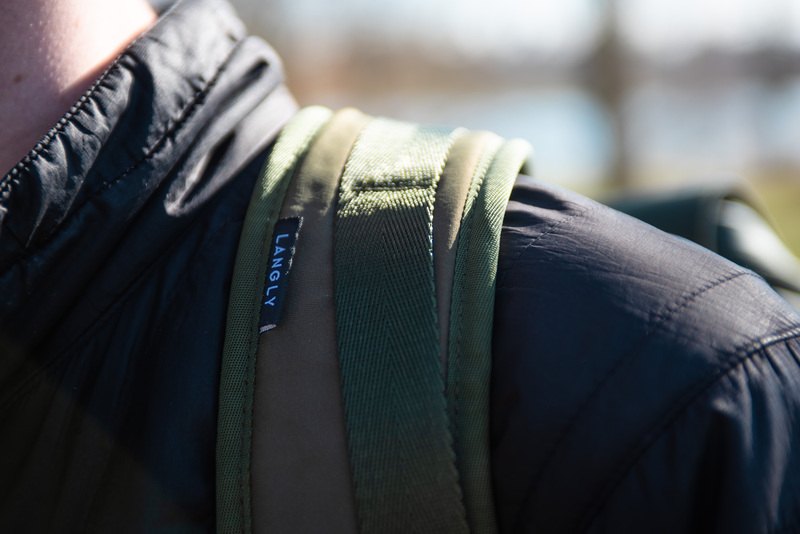 The two main zippers (one for the gear compartment and one for the top compartment) are weatherproof, while all the other pockets are enclosed with a pin-buckle system. The Alpha's pin-buckles snap and lock into place, securing the flaps they're attached to. 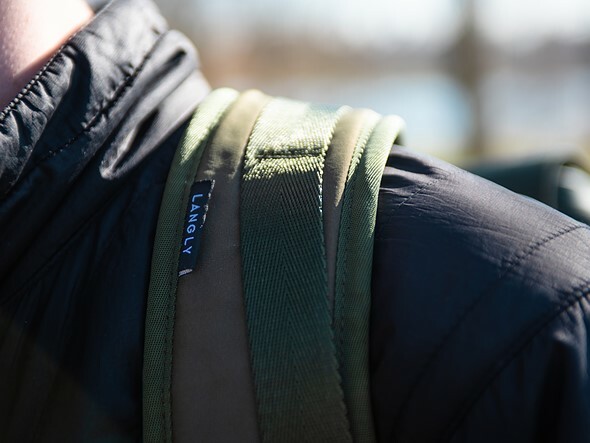 The weather-proofing is definitely welcome but while Langly advertises itself as an outdoor-oriented brand, I'm a bit disappointed by the relatively simple nature of the Alpha's harness system. The shoulder straps are only slightly-padded and the hip straps have no padding at all. Another odd design choice here is the shoulder straps have plastic buckles you can undo, presumably for the purpose of storing them behind the large velcro strap in the middle of the back of the bag. There isn't really any issue here but it seems weird that the shoulder straps are storable but the hip straps really aren't. 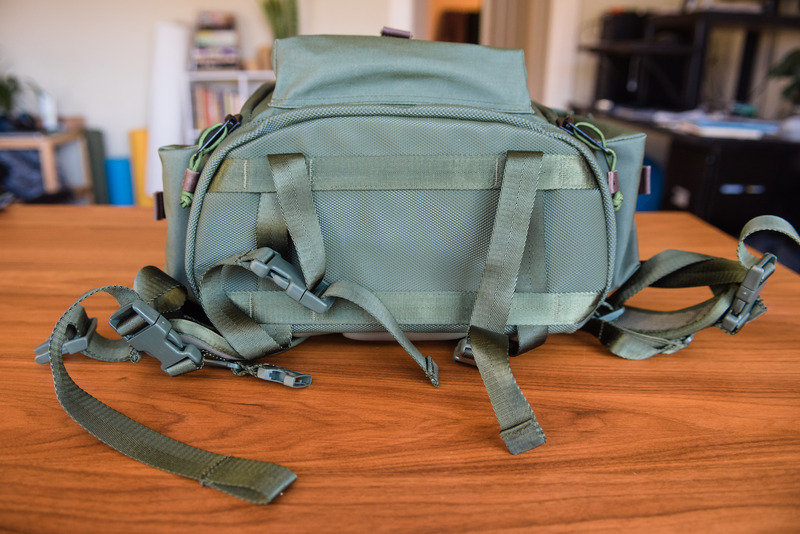 The Alpha also features straps on the bottom to use as a tripod holder (or to hold a sleeping bag – though I'd be surprised if anyone was taking this on extended hiking adventures). They're definitely useful for their intended function, but with all the other straps for the harness, plus the straps used for the pin-buckles, the Alpha feels way too 'strappy' for my taste. Some people like to have a lot of stuff dangling from their bags and that's fine, but I found it to be distracting and annoying more than anything else. 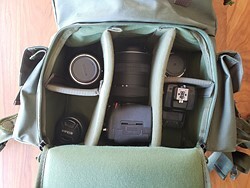 My basic organization for the gear compartment allowed me to fit a DSLR, four lenses and a flash. 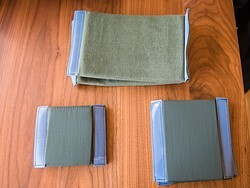 The Alpha includes 6 dividers in 3 different sizes. You likely won't need them all at once. The gear compartment also feels sturdy and the included dividers do their job. There's not much to note here other than the fact that the dividers don't come installed in any way. If you really like a blank slate to start from you might appreciate this but I definitely prefer to have some kind of organization in place that I can build from, mainly because I found getting the dividers to fit was just kind of a hassle. That said, once they were in there they feel snug and secure. Despite my gripes with the design of the Alpha, I enjoyed using it. Everything felt secure, the zippers were fairly smooth, and I was able to carry a pretty solid kit plus a book, some snacks, an extra sweater, etc. I was convinced I would hate the pin-buckles but actually found them super satisfying to use and had confidence in their staying locked. I found the weatherproof zipper plus double pin-buckles for the top compartment flap to be a bit confusing. It works just fine and protects everything but the flap just feels unnecessary. It's made of the same weatherproof material that's underneath, so other than giving the zipper a bit of added protection it's just added weight and bulk. The top flap also makes me think that the top compartment would be expandable, but because of the zipper, it isn't. Granted, it is plenty big for carrying your everyday essentials, so no complaint in terms of size. I'm just hung up on some of these odd design choices that feel counter-intuitive to what Langly seems to be aiming to accomplish with its bags. The non-expandable side pockets are my least favorite aspect of The Alpha. Comfort-wise, I felt good about wearing this bag for a bit, but I doubt it would be all that fun to lug on a hike. While Langly is clearly trying to carve out an audience in the outdoor photography community, the Alpha feels pretty lacking when it comes to the sorts of things I'd expect to see in a hiking/shooting backpack. 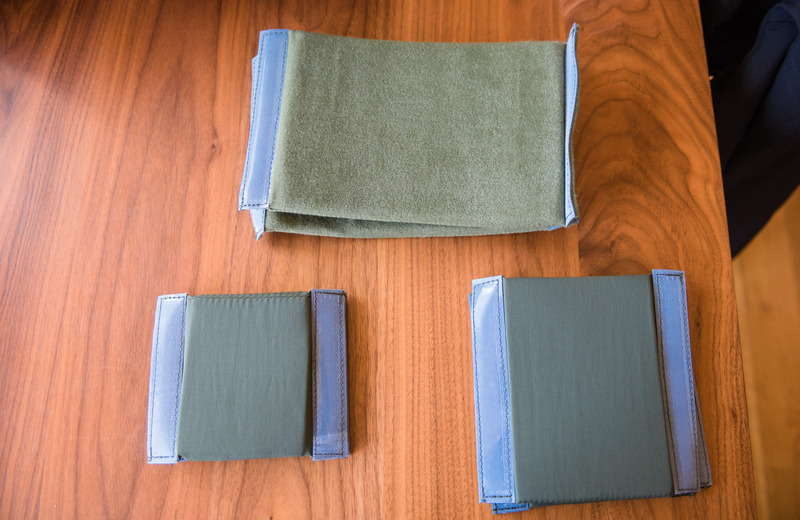 The only thing about the Alpha I strongly dislike is the design of the side pockets - they're fine for carrying additional items that might not fit in the other compartments. But the flap flops about when using them to carry a water bottle – they're also too snug to fit larger containers like a 32oz Nalgene. I definitely would have preferred an expandable mesh pocket or something similar with a breathable bottom. To sum up the Alpha in a simple phrase, I'd choose: 'style over substance'. 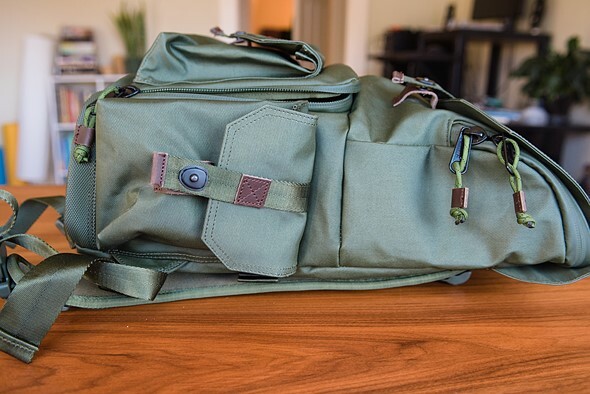 This bag looks great and would feel extremely appropriate in any #PNW #GetOutside #Adventure -tagged Instagram post, but anyone that's spent a lot of time in the outdoors would know that this bag isn't really any better-suited for that sort of thing than most other camera bags. It feels like it was designed for people to look like they spend time outdoors, rather than being designed for anyone to actually spend time shooting the outdoors. With that said, that's not such a bad thing. If you're into the style, it feels perfectly at home as an everyday shooting backpack to use in the city as well. It's probably not applicable to anyone shooting real professional stuff (photojournalism, sports, weddings, etc) but for engagement sessions out in the park? Sure. Actor head-shots downtown? You bet. If you like the style of this bag and your gear-carrying needs are pretty straightforward, then it will probably suit you well. The design flaws here aren't really deal breakers, they just feel like crossed wires in regards to what's important in a bag. Assuming you're okay with ~$250 of 'looks cool' on your back, get it, but I would at least consider some of the other options listed above if you're looking for something of a different style. Nice product shots with the sun BEHIND the subject so it’s completely in shadow. Good job! That's how you tell the real photographers from the fake ones. Those who can make backlight work (and they do) are way more skilled than those over the shoulder photographers who love harsh shadows. I have and use this bag everyday. i actually love it. 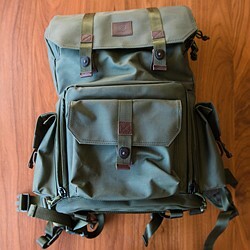 It's the best bag I've ever bought from a built and quality standpoint. My only gripe is that the bag itself is not lightweight. So after adding my camera, a few lenses, batteries and tablet, a light point and shoot (Fuji x100f) and other small miscellaneous stuff it easily becomes a heavy thing to lag around. Still I love using it and I'm very happy with it. When I was in Scouts, our leaders forbade ANYTHING from from dangling and swinging around from our packs or anywhere else. They explained that first it was noisy; second distracting; and third unsafe as stuff could get caught in protruding branches, etc. As an adult I still find stuff dangling from a pack to be annoying, and I don’t understand how anyone can put up with something swinging around and constantly smacking them. I see it all the time on the trail. Things like hand sanitizer, small key chain flashlight, a whistle and couple carabiner hooks dangling is must have and acceptable for a hiker, especially when you are on the go can't find a place to put your bag down to dig things out. The main reason I think no big heavy object should dangling in the bag is balancing, and you will be more tired with them swinging around while walking or running. What I don't like is a bag that big load with stuffs does not have waist strap support. So, the usual question, can you access the camera and lenses without stopping and taking off the pack? I think I’ve seen you ask this before, so the usual answer: of course not. By definition a backpack is on your back, so unless you have tremendously long, bendy arms with eyes at the ends you are going to have to remove the pack to get to stuff. Bad thing? Last night I hiked about 1.5km to a place to photograph sunset. I wouldn’t have wanted to do that with a sling bag that DOES allow ready access. When I got there I set the pack down and ripummaged around as much as I needed as I took my shots. However if I’m shooting where I need constant access to change lenses, etc. then I use a sling bag. Whether to use a pack depends on your use. 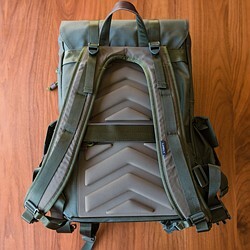 PLShutterbug: There are backpacks that are designed so that you can access gear without putting the pack down. For example Mindshift Gear's Backlight, Ultralight and Rotation180 series all work that way. 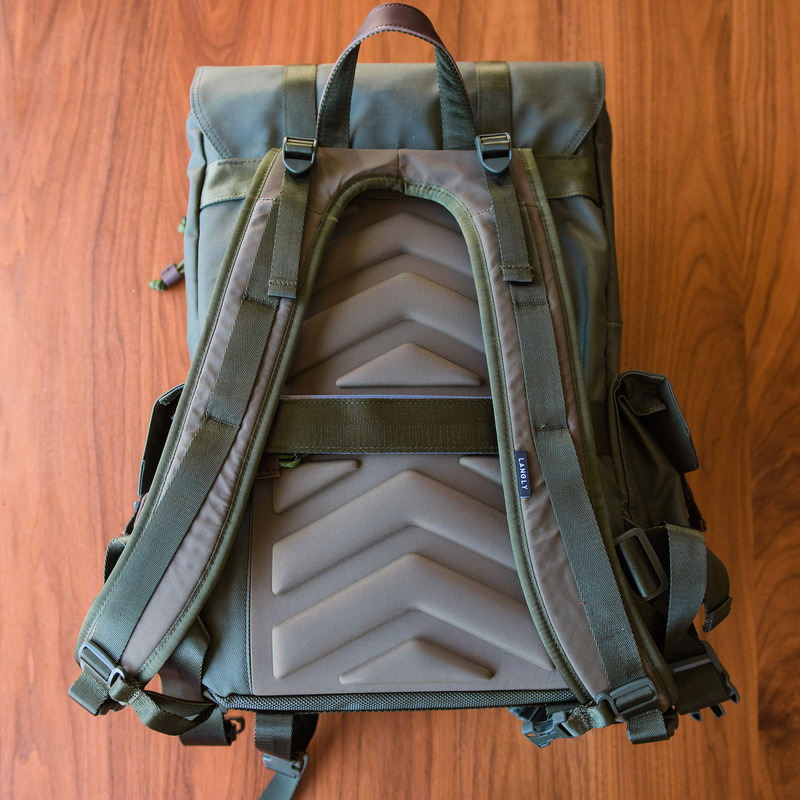 Back-access, like in the Backlight series, makes the pack also safer as you can't accidentally drop gear from partially open pack. It also stops thieves quite effectively. You can train a monkey to fetch the required gear out of your backpack. Or use AI which is the solution for everything these days. The back at least has some padding and ventilation. But it looks flat and un-ergonomic. Also, the waist straps look like junk. Rather than suffer through unpadded flat webbing, I'd cut them off and go without. Attractive? Really? Fugly more like. agreed. This is one of the most ugliest ones I've seen. Once again a review makes a point of singling out "retro", and not in a good sense. Nothing wrong with offering something with features which have been seen in the past. 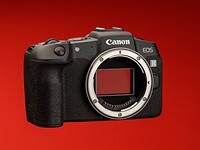 The Df and Fuji X cameras succeed because they offer a style of control which people like and which works. To imagine people buy them out of nostalgia is a bit demeaning to those people, and to the designers who produce them. Same with this pack. Judge it on how it performs, not whether it's "retro". At first sight it looks a good pack; I'd have to see and try it in person to really judge it. And to me having decent side pockets rather than mesh ones is a big plus. Yep Fuji's design language is functional, not retro. Physical buttons and controls offer a tactile feel. There might be a classical aspect of Fuji's design language, but the fact that there are physical controls is not about retro. I'm not denying that Fuji and Nikon realised that the traditional look had sales potential and used it. But in both cases the bottom line was that these cameras were great to use and that's the main thing. Anyone out hiking should have enough water to get through the day. In a hot/humid climate where refilling isn't available, that's a gallon. Working in Australia we were required to carry 5 liters each shift. And we drank every drop of it. Bobthearch: On the other end of the scale, many hikers in Lapland forgo carrying water at all, or just have a 0.5L bottle as water is so abundant there that one can just fill their cup ("kuksa") straight from a nearby creek when thirsty. That said, not a fan of this pack. Made to look outdoors, but lacking in features. Heavy too considering the size. Carrying a water bottle is "virtue signaling?" Next thing you know those darn millennials will be breathing and eating too! Back in my day, we covered our faces with plastic wrap when we hiked, and we liked it! Unfortunately, there is lots of competition in this area so as a manufacturer you have to stand out by being different in style, not necessarily function. So I find many of these bags are designed from the style and cost to manufacture (meaning they lack features and are not of very high quality) objective. So what I usually end up doing is adapting a backpacking-specific kind of bag that's designed to carry some weight and make it a photo bag though inserts and adaptation. I also dislike photo bags that display that they are a photo bag with lots of expensive stuff inside. Sometimes people buy bags, even waterproof bags, to carry equipment to other indoor locations too. Not every use of a bag is for someone to get back to nature. "No convenient way to carry a water bottle". Surprised at some of the other comments here. Having a water bottle holder isn't "virtue signaling" or to "get back to nature". It's so that people, like me, don't have to buy over priced drinks when we're away from home. Plus, being hydrated has great benefits even if one isn't exercising. Staying hydrated is a matter of safety.